Fellow patients pity one another. Though of Chinese origin, this proverb is of universal application. People who find themselves in difficulties are sympathetic towards people in similar circumstances. Sorrow keeps company with sorrow. “Misery loves company.” “Grief best is pleased with grief’s society.” —Shakespeare. Doku o motte doku o seisuru. To counteract poison with poison. Acorns comparing their statures, one with another. Dorobo o toraete nawa o nau. To make a rope when the thief is caught. E ni kaita mo chi. A mochi (rice-cake) drawn in a picture (e). Ebi de tai o tsuru. 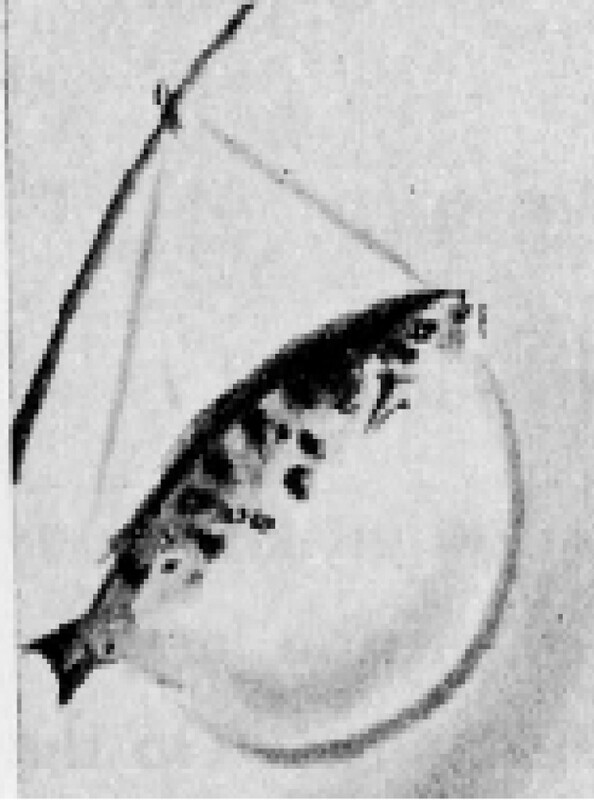 To catch a sea-bream with a shrimp. Edo no kataki o Nagasaki de utsu. To avenge the wrong done in Edo away at Nagasaki. Nagasaki is a noted port in north Kyushu, and it is a far cry from Edo (present Tokyo) to Nagasaki. This is said of wreaking one’s vengeance by an indirect method. Edokko wa yoigoshi no zeni o tsukawanai. Edoites do not keep their earnings overnight. The reference is to one of the traits of Tokyoites who are reputed to be the reverse of thrifty. There is, of course, the other side of the shield. We have a humorous skit on Edoites in the form of a humorous 17-syllable verse: “Edokko wa satsuki no koi no fukinagashi” (Edoites are as empty, if brave, as the May carp), meaning that they have a ready tongue, but often lack the courage to suit the action to the word. By “May carp” is meant giant carp streamers of cloth or paper which swim in the air from a long pole as a part of the celebrations of the Boys’ Festival (May 5). A strong man under the veranda. En wa ina mono (ajina mono). Marriage is a strange thing. This is the Japanese way of putting “Marriages go by destiny,” “Marriages are made in heaven,” etc. The adjective “ajina” means here much the same as ina, strange. Fufu-genka wa inu mo kuwanu. Even a dog does not eat a marital quarrel. A quarrel between man and wife is one of the things that should be left severely alone. Such a quarrel, according to another proverb, generally stops, like the west wind, when evening comes. Fugu wa kuitashi inochi wa oshishi. I would like to taste a swellfish, but I would not like to lose my life. 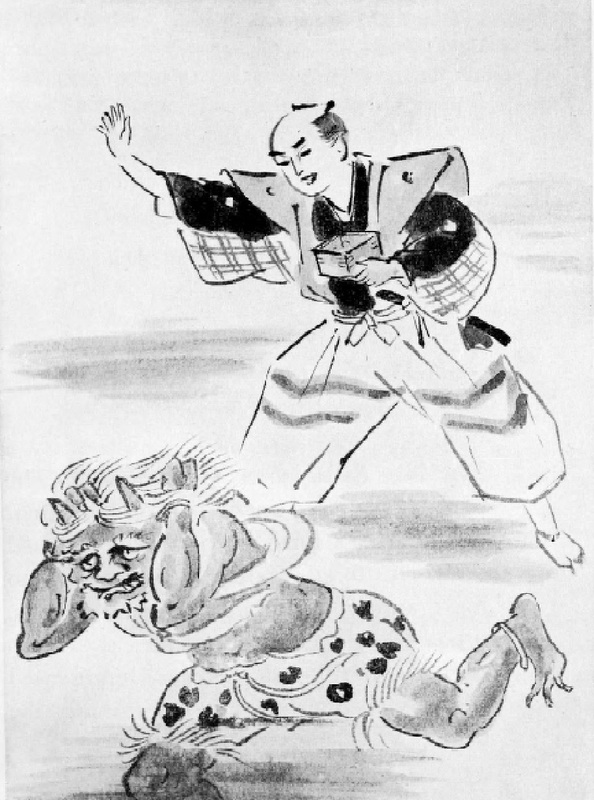 Fujiyu o tsune to omoeba fusokunashi. If you think inconvenience is always shadowing you, you will want nothing. This and the one that begins with “Katte” (Katte kabuto no o o shimeyo) and many others are said to be Fig. 10. Lanterns of all sizes, made of swellfish, are often sold as souvenirs. They are for ornamental rather than practical use. part of the injunctions of Ieyasu, the founder of the Tokugawa shogunate which lasted from 1603 to 1867. In with luck! Out with the demon! In Japan there is a time-honored institution known as the bean-scattering ceremony, performed on the last day of winter, according to the old (lunar) calendar. On the night of setsubun (the parting of the seasons), as this day is called in Japanese, parched beans are scattered at some temples, as well as in homes. The incantation with which beans are scattered to drive out imaginary devils and keep potential evils out has gained currency as a proverb. A rat in a bag. When a fugitive from justice, a man wanted by the police, is cornered, we say he is a mouse in a trap. Spilt water cannot be put back in the basin. The allusion is to the anecdote of Tai Kung-wang, a famous Chinese historical figure, of whom it is said that he told his divorced wife he would receive her back if she could put spilt water back in the basin. Just as a wife, once divorced, cannot return to her husband’s house, so an opportunity, once missed, cannot be seized again. What is done is done, and cannot be undone. “It is no use crying over spilt milk.” Cf. Kokai saki ni tatazu (Repentance does not go beforehand) and Shinda ko no toshi o kazoeru (To count the age of one’s dead child).